In our interview we talked to Stefan Padberg and Florian Kolb, both Managing Directors at innogy New Ventures, LLC and representatives of our location in Palo Alto, US how they look at our overall innogy approach 'to go outside to innovate from within'. Part of their four years journey is the initiation of the Free Electrons program, the first global energy accelerator program organized by the energy industry. In 2016 you initiated Free Electrons as the first global energy accelerator program organized by the energy industry. What was your intention and idea and how does it fit to your overall ambition? The energy market has seen rapid changes in recent years with the rise of renewables, decentralisation of the energy system, regulatory uncertainties, disruptive new technologies and more proactive consumer engagement. When we started our operations in Silicon Valley, we recognized that the energy industry could be more active and engaged in start-up ecosystems and also could help itself more in sourcing innovation. That is why we initiated and have created a global energy accelerator program, with other international utilities, to seek the most promising start-ups and co-create the next generation of ideas in energy, energy efficiency, e-mobility, digitization, data-driven business models and on-demand customer services. Free Electrons has a very strong value proposition for us: smart start-up ideas meet a transforming corporate that is reinventing itself and has established lean and agile structures that speak 'start-up' and 'corporate' language alike. We support start-ups to scale fast – and at the same time, start-ups can enable us with the best possible products. We go outside to innovate from within. This year, you are running the Free Electrons Program for the second time. How do you see the program evolving 2 years after its start? Our pilot in 2017 got excellent feedback from the start-up's and corporates that participated in the program. We addressed and solved real problems, namely generating business, and therefore created a big success. 2018 is even performing better, both in terms of program quality and impact, as we also learned a lot from last years program. We now have two more utilities in the program, with CLP (Hong Kong) and AEP (USA) joining Ausnet Services (Australia), DEWA (Dubai), EDP (Portugal), ESB (Ireland), Origin Energy (Australia), SP Group (Singapore), Tokyo Electric Power (Japan) and of course, innogy. And, having the bar already set high with 450 applications in 2017, we are very pleased to have exceeded that number with 515 applications across 65 countries in 2018. These numbers created the tough challenge of choosing the 'best of the best', but attracting so many global talented start-ups translated into very successful results. This year, taking the learnings from the first edition, we have improved the way the program is structured, and are already running an amazing number of pilots. After a kick-off 'Bootcamp' in Lisbon early in the year and a first successful module in Sydney/Melbourne where 15 pilots were launched, we were able in the Silicon Valley Module to openly learn from the initial pilots and grow from 15 to 28 in only 4 days. One of our a start-up's has been acquired by a strategic player in June, in addition to an investment announcement by one of the utilities in another start-up. Finally, we know that accelerator programs have a transforming effect on start-ups and corporates, helping them to grow, transform and scale as well as sourcing innovation effectively. In Free Electrons we have global, large corporates now joining efforts and sharing insights, running joint pilot programs and developing the future of energy together and alongside start-ups. All this demonstrates that, in only two years, we were already able to deliver and grow a world-leading open innovation platform. The innogy Innovation Hub is positioned as an Accelerator and Corporate VC with a clear target to identify game-changing ideas. How does innogy's approach to innovation fit with the FE program? Free Electrons perfectly supports our approach to stay ahead of the disruption that we are facing in the energy market. We have seen rapid changes with the rise of renewables, decentralisation, and groundbreaking technologies, and new consumer expectations. We know that we won't find all the necessary answers on our own. That's why since the outset, we've been proactively seeking an exchange with agile start-ups. We believe that it needs the best of both worlds to co-create innovative solutions for the future energy system and beyond. innogy has innovation activities located in Israel, Europe and US. In your team in Silicon Valley, you focus especially on topics that have the potential to disrupt the energy system. How does Free Electrons fit with this aim? We are constantly and actively sourcing high impact innovations for innogy. To that end, we leverage on a very strong network within the world's biggest high-tech ecosystem and we are always looking forward to new great opportunities for co-creation. Free Electrons, with its global reach and participants, provides the perfect fit for us. Together with other global utilities, we invite the most promising energy start-ups from all over the world to apply for collaboration on solutions that address the most pressing challenges of our industry and which have the potential to disrupt the future. A special highlight this year is that innogy will host the FE Award ceremony in Berlin. How does that feel? After the Silicon Valley focus of growing the pilot base and fostering cooperation, the third and final module in Berlin will allow members to focus on connecting innovation to the core business units - a key challenge for all innovation programs. 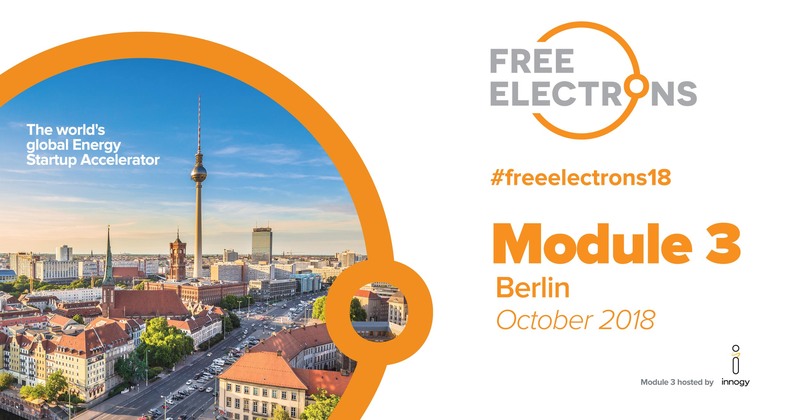 The 15 start-ups will spend a full week in Berlin with their 10 utility partners, with highlights of the program including working sessions in a true co-living environment – authentic Berlin style – and of course the award ceremony with the announcement of the Free Electrons 2018 "Best Energy Startup" award, worth 200,000 USD. Also, I feel we're on track to reach the Berlin finale with the potential for several new deals to be signed between the participants. Once again, we have the chance to make the vision of co-innovation between utilities and start-ups a reality and it is a great pleasure to close this year's round in Berlin, being able to involve even more innogy teams and helping connect this global program with our local innovation ecosystem. So, the expectations couldn't be higher and we're really looking forward to Berlin.